ProneOboe: Reed Pro Tip: Rotate! Does this sound familiar? You have a favorite reed. It feels great, and you play it all the time - at school, at home, in lessons. The response is right where you want it, all the time, and it just seems to get more and more comfortable for you the longer you play. It's a GOOD reed. Then, tragedy strikes. A flute player jostles your instrument and the reed breaks. Or it cracks against your teeth. Or it just finally gets too old to play on. And you are left looking at a case full of unfamiliar reeds - some too new and hard, some too old and close to death, and inevitably there's a concert or a competition coming up that very week. 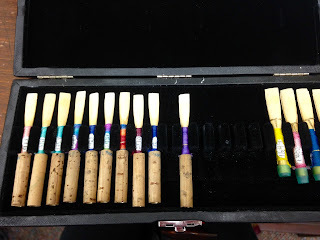 In a panic you order a reed from your teacher, or the store, or your favorite online reed-maker - and even though it's new, and customized for you, it DOES NOT feel as blissfully comfy as that sweet older reed did. It feels hard. It makes your mouth hurt. The response is unexpectedly slow, or alarmingly fast. It distracts you and causes you to make mistakes. This is why ROTATION is so important. In my case right now I have about twelve - okay, ten - playable, good oboe reeds. I recommend that every player have AT LEAST THREE. Here's how the process might work. Your case contains three reeds: A, B, and C. On Monday you play A. Tuesday, B. Wednesday, C. On Thursday, when you come back to reed A, you might find that it feels wimpy or sharp and edgy compared to the other two. You don't like it. So you order a new one, and begin to rotate your new reed, D, in with B and C. Reed D gradually gets broken in and comfy, and as B ages out you bring in a reed E to replace it. On concert day or lesson day you choose the one which feels or sounds the best - which is something that you already know because it's only been a few days since you last played each choice - then resume your rotation. This is useful for several reasons. Since it is inevitably the case that every reed feels different on the oboe, and that every day and in every venue the instrument itself, as well as the reed, reacts and changes, you might as well get accustomed to that variability. Don't be the oboist who can only play in optimal conditions, because having those when you really want them is RARE. And since a brand new reed will never feel quite as broken in and comfy as an older one, it makes sense to keep reeds in a few different stages. You can use older ones for chamber music or teaching days, brand new ones for practicing, and slightly broken in ones that still have lots of body in the orchestra. And finally, If you only use a given reed twice a week, say, each one will last much longer than would otherwise have been the case. I can only play a reed heavily for a week or so - at most! - but I have options in my case right now that were made back in October. They've got a few more services in them, and it's nice to have a safety net of reeds that are well broken in and safe when all else fails!